It is the goal of Cost Company to complete all projects skillfully, on time, within budget, and without jeopardizing the health and well-being of the team or the general public. The pursuit of this goal is realized by making safety management a core value. We have a very experienced and proactive construction safety management team dedicated to the enhancement of a positive ‘Safety Always’ culture. 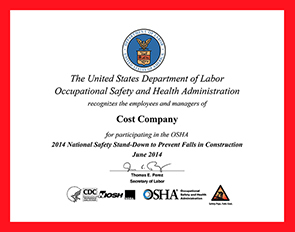 In fact, Cost Company recently participated in Occupational Safety and Health Administration’s (OSHA’s) 2014 National Safety Stand-Down to Prevent Falls in Construction. The purpose of this initiative was to join other construction companies and industry groups to raise awareness of preventing fall hazards on construction sites. Fall prevention safety standards were among the top 10 most frequently cited OSHA challenges. A Safety Stand-Down is a voluntary event encouraging employers to talk directly to employees about safety. In this, Cost recently joined other companies to plan a toolbox talk or another safety activity such as conducting safety equipment inspections, developing rescue plans, or discussing job specific hazards. The Safety of our people is second-to-none. We believe that safety, quality, and productivity are inseparable and work hand in hand. We must deliver on these values for every project to be a success. We believe that the quality assurance and quality control process is integral to our way of doing business. Our director of quality works with the project management to delegate on-site quality control responsibilities, and efficiently implement the project-specific quality control plan. Safety is a core value and is an integral part of our company’s culture. Cost Company’s project-specific quality control and / or quality assurance plans are designed, implemented, and maintained in conformance with project requirements. Our plans conform with ICRA, ASHE, and USACE requirements for institutional projects, and NAVLAP guiding principles and LEED® requirements for all other projects as required. The plans address product submittal and approval control, procurement control, contract document control, change directives, material delivery and storage control, installation workmanship standards, testing and inspection, as well as photography and document control. Our project-specific plans establish quality assurance activities at the earliest time possible and are consistent with the schedule to accomplish the activities in a successful manner from start to finish. The key to achieving quality is preparing a QA/QC plan at the outset or pre-planning stages of the project and executing the plan throughout the duration of the project. Quality in construction is not something that is just created; quality must be inherent in the design to be achieved in the field. Therefore, to produce the best quality in both design and construction, our goal is to “build the project on paper” to minimize any surprises once construction begins, and know the job better than anyone else. The better prepared we are going into a project, the more time we can spend constructing the project. Pre-Qualify. This is required of all subcontractors, vendors, and suppliers. Pre-Plan. Pre-planning for safety begins with the bid documents and is constant throughout the construction process. Upon award of a project, the project team develops a Definable Features of Work (DFW) document based on the bid packages, phases of work, and identification of tasks to be completed. With each new phase of work, the team plans a pre-installation meeting and identifies it in the schedule. This date represents the due date for the job safety analysis to be completed. Educate. Communication of safety, health policies, and procedures begins on the employee’s first day at the employee orientation. Each Cost employee receives training on the identification of potential hazards he/she may encounter on the job site, preventive measures or corrective actions, and the OSHA regulations. Cost keeps employees informed of updates or changes to the site health and safety plan and OSHA regulations through safety meetings, written notices, and posting of notices on the company bulletin board. Cost communicates this information in a manner understandable to all employees. Enforce. Safety is the responsibility of every Cost employee. Safety is a metric that everyone on the job will always remember; at Cost Company, we take it very seriously and expect our subcontractors and vendors to follow suit. On a Cost project, no one person can say safety is their only responsibility; safety is everyone’s responsibility. Recognize. The Cost mission is to build a strong safety culture through education, training, enforcement, and recognition. Cost Company implements an employee incentive program based on safe hours worked to recognize and reward safety performance. Projects that achieve our company goal of “Zero Incidents” per each quarter receive recognition. Four consecutive quarters of incident free work is recognized via the Cost Platinum Award. Reward. Cost rewards employees who maintain the highest possible standards of safety in their day-to-day work activities. Our incentive program does more than enforce OSHA regulations; it changes attitudes and behaviors, maintaining a safety culture throughout our company.